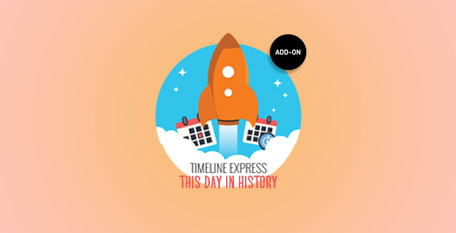 With the Timeline Express – This Day in History Add-On only events that occurred on the current (or specified day) will be displayed back on the timeline. For history websites that display information about the current day in history, this add-on is perfect. This add-on will automate the process of limiting what’s visible on the timeline to the current date, allowing you to populate your site with hundreds or thousands of announcements and ensuring they display properly. The Timeline Express – This Day in History Add-On makes use of the Timeline Express built-in caching system to ensure your page loads time are quick and the impact to your overall site is minimal. Alongside the ability to display the events for the current day you can also specify a certain date and display all events from them. For example, you can create 10 announcements spread across 10 years with the same month/day. (10/31/1990. 10/31/1991, 10/31/1992 etc.) You can then specify in your shortcode the month/day and all events from that point in time will display on your timeline. Don't forget to bundle and save! Purchase Timeline Express and 1 or more add-ons and receive a 20% discount off your purchase. Timeline Express is trusted by hundreds of thousands of customers around the world. Code Parrots is proudly based in Philadelphia, PA, where we curate high quality, free and premium, WordPress plugins.